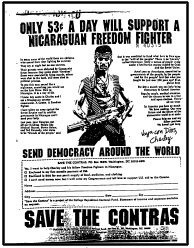 Ad placed by the Young Republicans, one of the groups under the cognizance of the Office of Public Diplomacy and discussed by Oliver North in a March 20, 1985 memorandum. Washington, D.C., March 2, 2001 – The Bush administration has floated the name of Otto Juan Reich for possible nomination as Assistant Secretary of State for Latin American Affairs (see Al Kamen, "In the Loop," The Washington Post, 15 February 2001). Mr. Reich served in the Reagan administration as assistant administrator of the Agency for International Development (AID) from 1981 to 1983, then as the first director of the State Department's Office of Public Diplomacy for Latin America and the Caribbean (S/LPD) from 1983 to 1986, and finally as ambassador to Venezuela. The Comptroller-General of the U.S., a Republican appointee, found that some of the efforts of Mr. Reich's public diplomacy office were "prohibited, covert propaganda activities," "beyond the range of acceptable agency public information activities..." The same September 30, 1987 letter concluded that Mr. Reich's office had violated "a restriction on the State Department's annual appropriations prohibiting the use of federal funds for publicity or propaganda purposes not authorized by Congress." The letter also said, "We do not believe, however, that available evidence will support a conclusion that the applicable antilobbying statute has been violated." The General Accounting Office in an October 30, 1987 letter and report found that Mr. Reich's office "generally did not follow federal regulations governing contractual procedures" in its contracting "with numerous individuals and several companies." The GAO quoted Mr. Reich as saying "he was generally unfamiliar with the details related to the office's contracting procedures. Instead he relied on his staff as well as State's procurement office to ensure that federal regulations were adhered to." The bipartisan report of the Congressional Iran-contra committees (November 1987, p. 34) found that "[i]n fact, ‘public diplomacy' turned out to mean public relations-lobbying, all at taxpayers' expense." The committees concluded their discussion by quoting the Comptroller-General's findings in the September 30, 1987 letter. A detailed critique of the public diplomacy operation, written by Iran-contra committee staff, was deleted from the Iran-contra report after heated partisan debate (see Robert Parry and Peter Kornbluh, "Iran-Contra's Untold Story," Foreign Policy, No. 72, Fall 1988, pp. 3-30). A staff report by the House Foreign Affairs Committee (September 7, 1988) summarized various investigations of Mr. Reich's office and concluded that "senior CIA officials with backgrounds in covert operations, as well as military intelligence and psychological operations specialists from the Department of Defense, were deeply involved in establishing and participating in a domestic political and propaganda operation run through an obscure bureau in the Department of State which reported directly to the National Security Council rather than through the normal State Department channels…. Through irregular sole-source, no-bid contracts, S/LPD established and maintained a private network of individuals and organizations whose activities were coordinated with, and sometimes directed by, Col. Oliver North as well as officials of the NSC and S/LPD. These private individuals and organizations raised and spent funds for the purpose of influencing Congressional votes and U.S. domestic news media. This network raised and funneled money to off-shore bank accounts in the Cayman Islands or to the secret Lake Resources bank account in Switzerland for disbursement at the direction of Oliver North. Almost all of these activities were hidden from public view and many of the key individuals involved were never questioned or interviewed by the Iran/Contra Committees." Mr. Reich responded in detail to questioning by staff of the Iran/Contra Committees in a formal deposition on July 15, 1987. The full text of the 122-page deposition is included here. Part of the questioning revolved around a lengthy March 20, 1985 memo written by Oliver North to National Security Adviser Robert McFarlane, providing "the chronology of events aimed at securing Congressional approval for renewed support to the Nicaraguan Resistance Forces." The chronology contains repeated listings of actions to be taken by "State/LPD (Reich)"; however, Mr. Reich testified that he "never saw it as a tasking memorandum" and that he was unaware that his contractors were involved in lobbying efforts or ads targeted on specific members of Congress. North's memo also referred to an advertisement ("53 cents per day supports a freedom fighter") that was off-message; the text of the ad was attached to Mr. Reich's deposition as an exhibit. On March 12, 1985, one of Mr. Reich's staff, Daniel "Jake" Jacobowitz, on detail from the U.S. Air Force, wrote a detailed "public diplomacy action plan" that paralleled the North chronology, with candid commentary about the lobbying campaign including a three-item list of audiences: "U.S. Congress," "U.S. media," and "interest groups." On March 13, 1985, Mr. Reich's deputy, Johnathan S. Miller, wrote a two-page report to White House director of communications Pat Buchanan, giving what Miller called "[f]ive illustrative examples of the Reich ‘White Propaganda' operation." These included op-eds the office had written or placed covertly, without any acknowledgement of the government's role, and planned op-eds under the contra leaders' bylines. Mr. Reich sought and obtained staff for his office by getting them detailed from various U.S. military units engaged in "psychological operations." The declassified documents include requests for these detailees on March 5, 1985 and on September 18, 1985, a staff discussion of the need for detailees on December 10, 1985, a December 16, 1985 request for certificates of appreciation for five detailees, and a plaintive memo to NSC staffer and former CIA official Walt Raymond on January 5, 1986 complaining that the Pentagon had turned down a new request for detailees. Perhaps the most illuminating discussion of the psyops detailees can be found in a May 30, 1985 memo from Jake Jacobowitz to Mr. Reich about the impending arrival of five detailees, calling them the "A-team" and including the comment "Since he is a PSYOP type he will also be looking for exploitable themes and trends..."
The final document included here is an April 15, 1984 memo drafted by Mr. Reich for Secretary of State George Shultz to send to President Reagan, describing a specific intervention by Mr. Reich with CBS News as an example of the day-to-day work of the public diplomacy office. Document 1: Comptroller General of the United States to Dante Fascell, Chairman, Committee on Foreign Affairs, House of Representatives, [Legal Opinion on Issue of Alleged Lobbying and the Development and Dissemination of Propaganda], September 30, 1987, 10 pp. Document 2: United States General Accounting Office, Report to Congressional Requesters, State's Administration of Certain Public Diplomacy Contracts, October 1987, 14 pp. Document 3: Report of the Congressional Committees Investigating the Iran-Contra Affair, November 13, 1987, Excerpt, 2 pp. Document 4: Committee on Foreign Affairs, U.S. House of Representatives, Staff Report, State Department and Intelligence Community Involvement in Domestic Activities Related to the Iran/Contra Affair, September 7, 1988, 34 pp. Document 5: Deposition of Otto J. Reich before the Senate Select Committee on Secret Military Assistance to Iran and the Nicaraguan Opposition, July 15, 1987, 70 pp. Document 6: NSC Intelligence Document, Oliver North to Robert C. McFarlane, Timing and the Nicaraguan Resistance Vote, March 20, 1985, 8 pp. Document 7: Col. Daniel Jacobowitz (Office of Public Diplomacy), Public Diplomacy Action Plan: Support for the White House Educational Campaign, March 12, 1985, 9 pp. Document 8: Johnathan S. Miller (Office of Public Diplomacy) to Pat Buchanan, Director of Communications, The White House, "White Propaganda" Operation, March 13, 1985, Confidential, 3 pp. Document 9: Memorandum, Otto Reich (Office of Public Diplomacy) to Ray Warren (Department of Defense), TDY Personnel for S/LPD, March 5, 1985, 3 pp. Document 10: Otto J. Reich (Office of Public Diplomacy) to Col. David Brown, Executive Secretary, Office of the Secretary of Defense, [Request for Detail of Military Officers to Office of Public Diplomacy], September 18, 1985, 2 pp. Document 11: Office of Public Diplomacy, Minutes of the Public Diplomacy Meeting, December 10, 1985, December 11, 1985, 1 p.
Document 12: Otto Reich (Office of Public Diplomacy) to Mrs. Roosevelt, Request for Tributes of Appreciation, December 16, 1985, 7 pp. Document 13: Otto Reich (Office of Public Diplomacy) to Walter Raymond (National Security Council), Denial of Detail of Personnel by DoD, January 5, 1986, 3 pp. Document 14: Col. Daniel Jacobowitz (Office of Public Diplomacy) to Otto Reich (Office of Public Diplomacy), Duties of TDY Military Personnel, May 30, 1985, 2 pp. Document 15: Secretary of State George P. Shultz, Memorandum for the President, News Coverage of Central America, April 15, 1984, 3 pp.